Vajravarahi is one of the female Buddha forms, also known as Vajradakini (Diamond Skywalker) or Vajrayogini (Diamond Spiritual Athlete). These female archetype deities symbolically illustrate the Buddhist insight that enlightenment is beyond all sexual identity. Vajravarahi, literally the Adamantine Sow, is the consort of Chakrasamvara, the presiding deity of the Samvaratantra. A sow's head can be seen projecting from the apex of her crown of skulls. 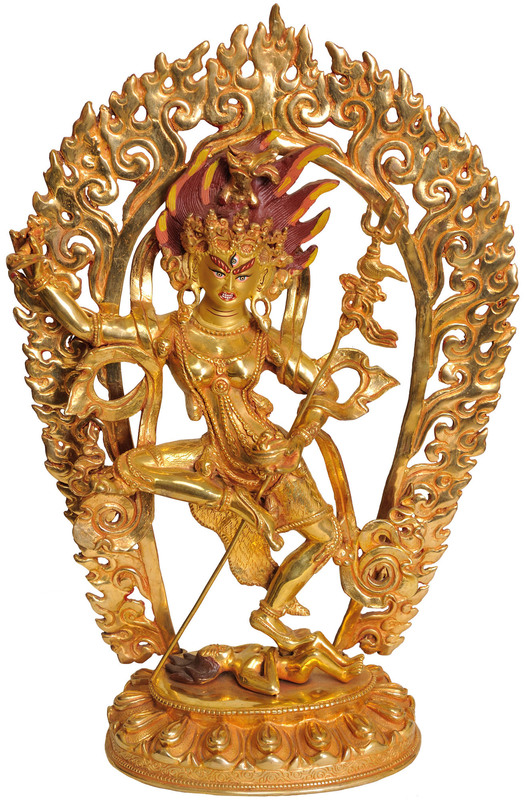 The three-eyed, red Vajravarahi stands in a dancing pose with one foot on a figure lying on its back, and with her right leg raised and suspended in the air in an awesome posture. Although an animal skin wraps her hips and thighs, she appears naked. She has hag-like breasts. Apart from various jewelry she also wears a garland of severed human heads. She wears gold earrings, and fine bone ornaments adorn her body. The swaying strands of her ornaments reinforce the movements of her body and conjure the tinkling sounds of bone and bell that accompany her dramatic dance. Even livelier is the delineation of the scarf which swirls on either side of her body and forms a sort of halo around her head. With her right hand she brandishes a chopper and with her left a skullcup. A khatvanga (magic staff) with severed heads and crowned with a skull, is held against her body by her left arm. Vajravarahi is the tutelary goddess of the nunnery of Semding, where every abbess is considered to be her emanation. She is also a very important goddess for the Drukpas, a subsect of the Kagyupas, who perform a special ritual for her every year on the twentieth day of the sixth month. Sharp, almost abstract clarity, a vigorous spirit, and a touch of acerbic wildness characterize the distinctively Tibetan integration of the ideal and the real in this sculpture, bathed in the richness of 24 karat gold.